Questcor Pharmaceuticals Inc. (QCOR) soared 21 percent to $18.05 after jumping to $18.50 earlier, the highest intraday price in 23 years. The developer of a treatment for seizures in infants today announced preliminary operating metrics for its first quarter ended March 31, 2011. Questcor said Q1 gross sales were $48.6 million and the company saw a 40% increase from the prior quarter and 115% increase in paid prescriptions for its H.P. Acthar Gel (Acthar) for multiple sclerosis treatment, compared with the year-ago period. As of March 31, 2011, Questcor said it’s cash, cash equivalents and short-term investments totaled $122 million. From a technical perspective, QCOR is trading above the major moving averages as it continues to catch more aggressive bids after printing a new 52-wkh. The ticker is surging higher intraday on good breakout trading volume with price nearing a HOD re-test, which is $18.50 a share. This recent high will act as a resistance for the stock should it trade up to that level. Since November 9, 2009, QCOR has marched consistently higher along the support of its 200-month MA, currently located at $14.08 level. From a valuation perspective, QCOR shares trade at a 9.83x on a price to sales basis. The ticker has a trailing P/E of 33.81, a forward P/E of 19.22 and a P/E to Growth ratio of 0.77. The median Wall Street price target on the stock is $19.00 with a high target of $23.00. At last check [12:58 a.m. EST], QCOR shares were up over 22% to $18.25 in trading on the Nasdaq. The stock’s volume has swelled to more than four times the stock’s daily average. More than 4.9 million QCOR shares have already traded hands compared to a daily average of around 1.1 million. 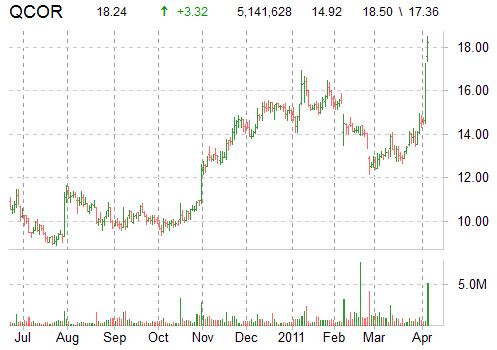 In the past year, Questcor Pharma has hit a 52-week low of $7.84 and 52-week high of $18.50. Disclosure: I currently hold no position, long or short, in Questcor Pharmaceuticals, Inc.